The basic operation of a thermal mass flow meters is to measure flow by introducing heat into the flow stream and measuring the heat dissipation between one or more temperature sensors. Thermal mass flow meters are very popular for several reasons. They have no moving parts, have a fairly unobstructed flow path, are accurate over a wide range of flow rates, calculate mass flow rather than volume, measure flow in large or small piping systems, and do not need temperature or pressure compensation. While most thermal flow meters are used to measure flowing gas, some also measure flowing liquids. Thermal mass flow meters are cost effective and accurate making it an excellent choice for a wide variety of gas flow applications. 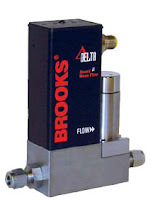 Brooks SLA Thermal Mass Flow Meters from Instrument Specialties, Inc.